Have you ever noticed the different styles of hats that are out there in the sports market? The other day I was watching a football game and noticed the variety of styles, graphics, sizes, and materials of people’s headwear. I know…why was I looking at what people were wearing and not at the football game? It’s what I do – I’m always looking for new ways to help my customer. Each of the hats listed above can be found in any sport, worn by players, coaches, parents, fans, and staff members. 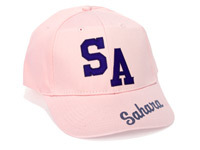 Hat decoration offers a great way for you to add onto your sales. Custom baseball hats aren’t the only product people want these days; there are a variety of heat transfer materials, media, and graphics that can be applied with a heat press to the hats, whether they’re part of a uniform, a coach’s outfit, or a way for boosters to show their support. When you are decorating hats don’t just think of the front center of the hat. You can also apply a player’s name, number, school name, or sponsor name to the side, back, or bill of the cap. Check out our hat education page for more information on how to decorate hats, average sizes, printable areas, and the products that can be applied to them. Next Post Heat Printing on Sweaters?